Noisy “kek, kek, kek” cackle in flight. Description: Sexes similar. Head, neck, breast, and belly have purplish-blue sheen. Pale blue forehead shield. Bill is red with yellow tip. Back is brownish-green. Yellow legs and feet. Juvenile light brown with olive colored back. 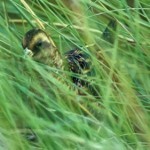 Juvenile also lacks bright forehead shield and bill. 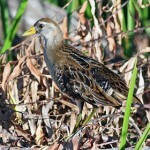 Habitat: Marshes, and habitats near large river courses. Where in Nebraska: Accidental. One observed in Gage County, Nebraska in March of 1962. 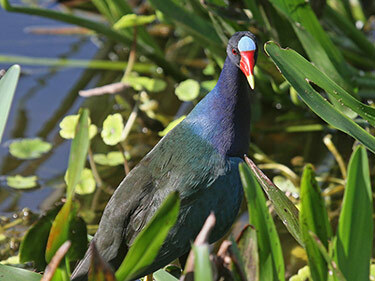 Fun Facts: Purple Gallinule’s long toes allow it to walk lightly on lily pads and other floating vegetation. 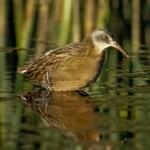 Despite their awkward flying will swim on water like ducks and walk on floating plants much like chickens.